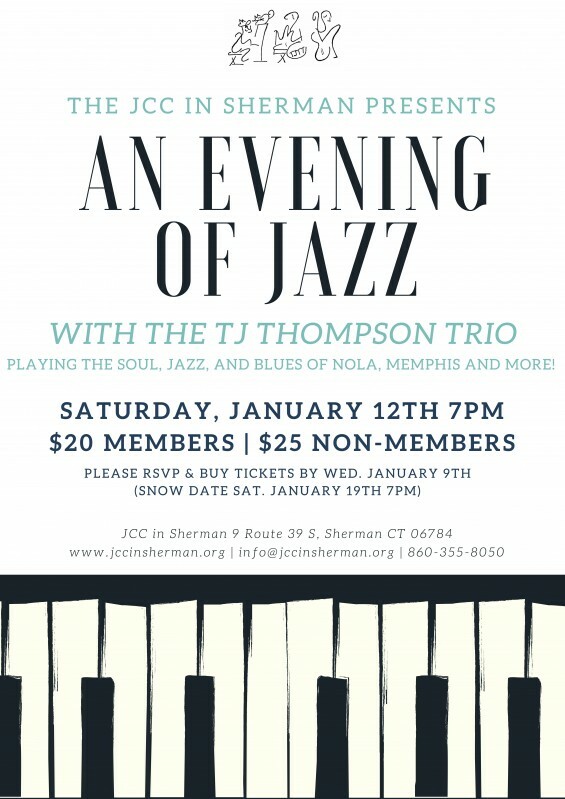 Come escape the winter cold, and join us at the JCC in Sherman for an evening of jazz on Saturday, January 12th at 7PM with Connecticut’s jazz band The TJ Thompson Trio. The band will be playing soul, jazz, and blues of New Orleans, Memphis and more! The T.J. Thompson Trio has been active since 2014 performing in various clubs and pits in musical theaters throughout Connecticut. Winner of the IMEA Jazz Artist of the Year for their recent album Take Two: The Sound of Playing, this group plays a combination of originals along with the Soul, Blues, and Jazz of New Orleans, Memphis, and beyond. We cover everything from Jelly Roll Morton, Professor Longhair, Thelonious Monk, Booker T and the MG’s, Jimi Hendrix, The Dead, and more. Leader T.J. Thompson performed with Betty Carter’s Jazz Ahead at the Kennedy Center for the Performing Arts in Washington, DC, and as a result was a featured artist on Branford Marsalis’ Jazz Set show on NPR. In 1998 he recorded and produced Thompson Trio Take One, an album consisting mostly of original works, which received good reviews from Goldmine and Cadence magazines. A student of both Henry Butler and George Cables, he has opened for and worked with such artists as Henry Butler, Mel Torme, Ed Thigpen, Dave Liebman, and Koko Taylor as well as being a featured soloist on the Morgan Powell Jazz Album. He taught at St. Johnsbury Academy and Johnson State College in Vermont from 1997-2000 and since has been the Director of Instrumental Music at the Taft School, in Watertown, Connecticut. Tickets are $20 for members and $25 for non-members. Pre-paid registration required by Thursday, January 10th. Please reserve online at jccinsherman.org or call/email us at 860.355.8050 or info@jccinsherman.org. If there is a snow, the show will be postponed to the following Saturday, January 19th at 7PM.